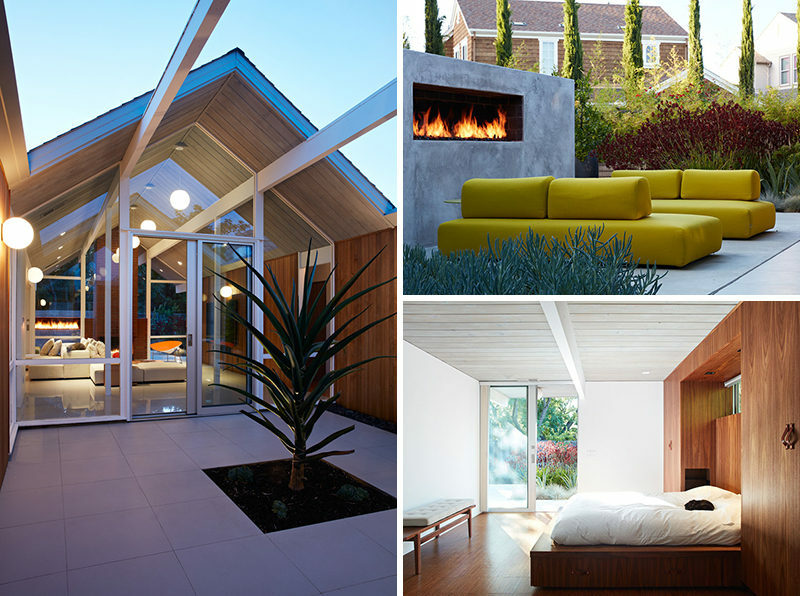 Klopf Architecture together with Outer Space Landscape Architects, Sezen & Moon Structural Engineer and Flegels Construction, have updated a classic Eichler home in Mountain View, California. 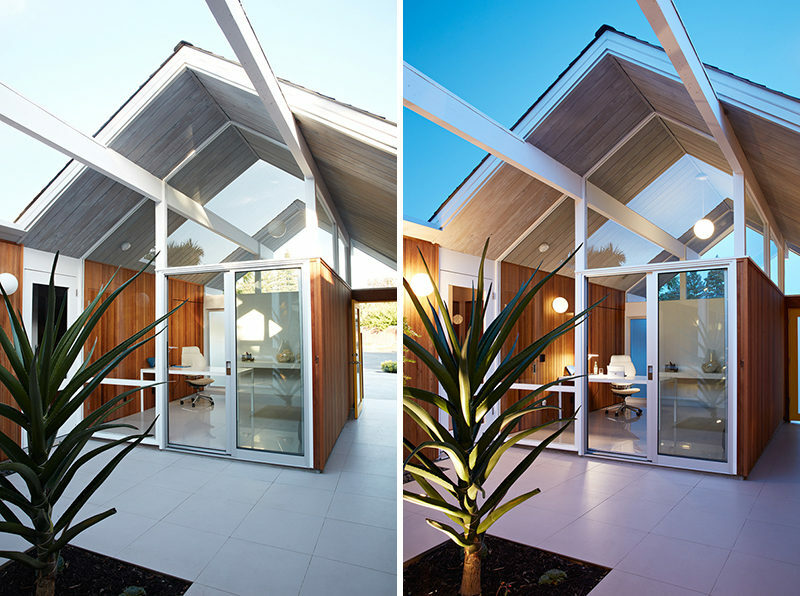 The home owners loved the classic, original look of the home, but needed it updated for their contemporary lifestyle. 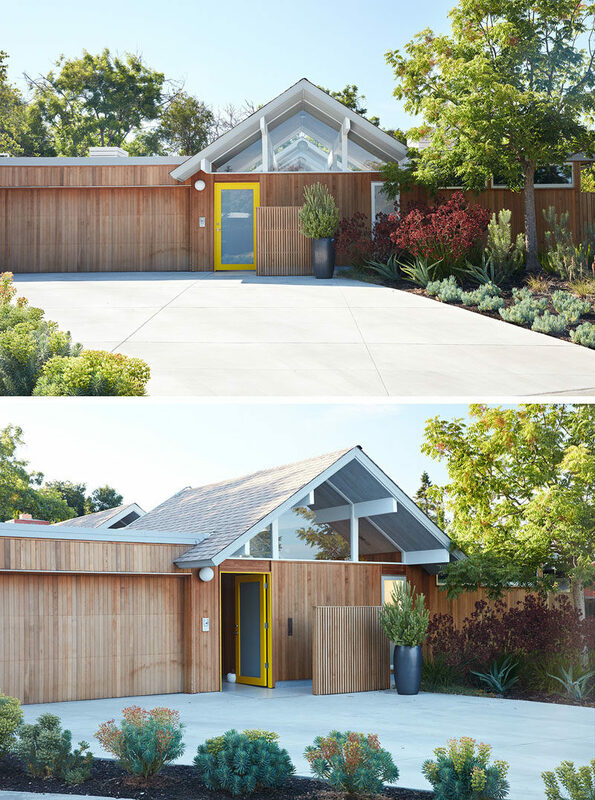 The new, natural wood exterior siding runs through the house, updating one of the classic design features of the Eichler homes. Once you enter the home there’s a small courtyard separating the home office and the main house. Inside the home office, there’s plenty of light from the windows and floating shelves provide plenty of storage. Across from the courtyard you can see into the main living area of the home. 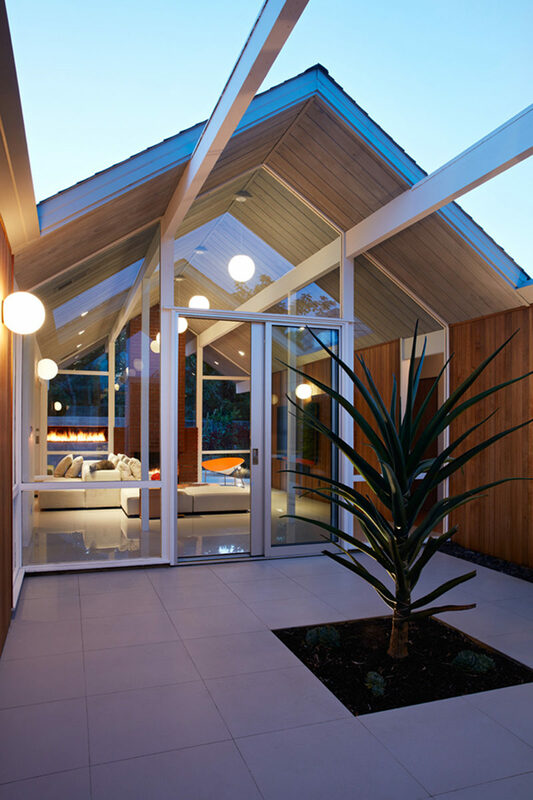 The barriers between the great room and kitchen were removed to create a large open plan living, dining, and kitchen area. Off the great room and at the side of the house, there’s an outdoor patio area with comfortable furniture and a large fireplace built into a concrete wall. 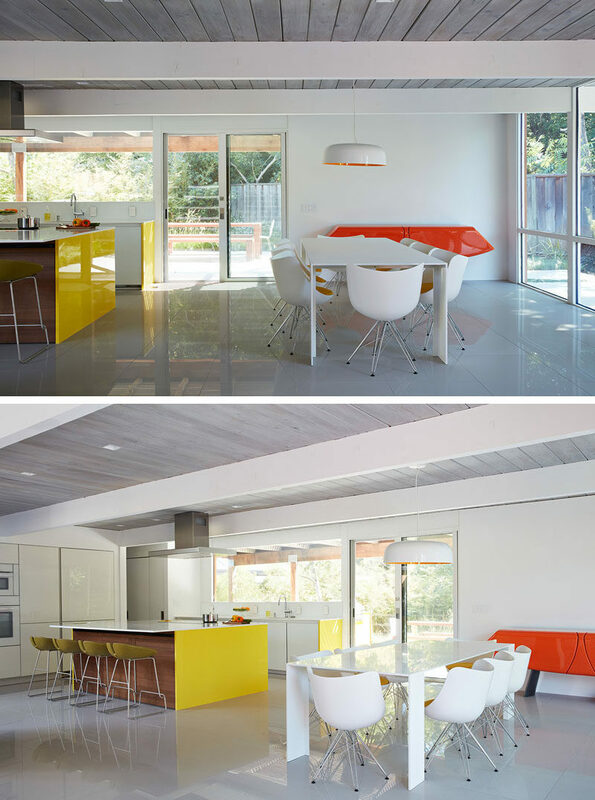 Back inside is the dining table, where sleek white furniture has been paired with pops of orange, and outside there’s another patio for outdoor dining. In the large kitchen designed for entertaining, there’s a wall of built-ins and an oversized island. There’s plenty of storage and lots of counterspace for everyone to prep and cook together. In the master bedroom, the bed now sits on a platform that’s tucked within a wall of built-in wooden wardrobes with leather handles. By replacing the master closet with these built-ins the designers were able to create a large master bedroom. 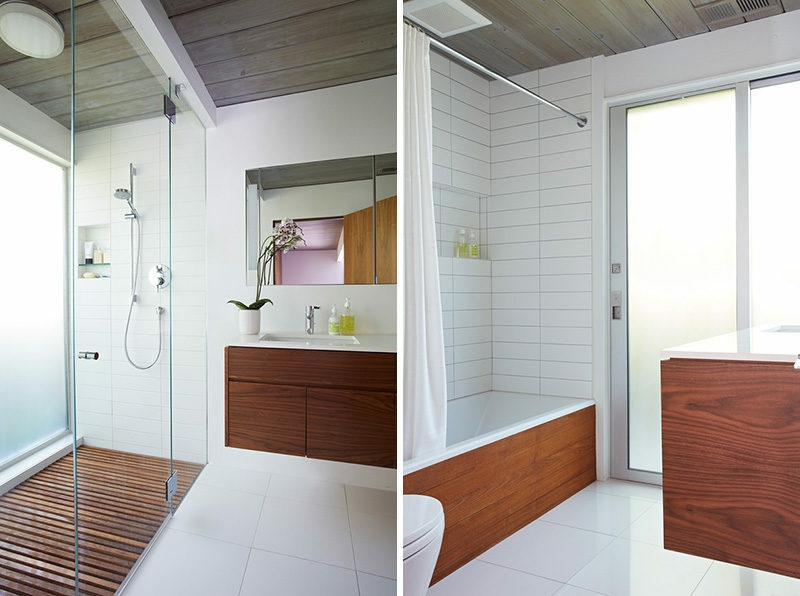 In the bathrooms, wood has been combined with white tiles on the walls and floor to create a clean contemporary look.